WASHINGTON, DC — Vanderbilt University, reasserting its efforts to become one of the nation’s higher education institutions known for outreach and diversity, came to the nation’s Capitol this month to take another bold step in demonstrating its work. Lead by a brief, compelling talk by Vanderbilt Chancellor Nicholas Zeppos, the university used the Smithsonian Institution’s new National Museum for African American History and Culture to introduce the nation to the new documentary film “TRIUMPH The Perry Wallace Story,” and to partner with the museum in staging an engaging panel discussion about race and sports. ‘TRIUMPH,” a raw, no-holds barred account of Wallace and Vanderbilt’s challenge to end segregation in SEC sports, “teaches us the role we sometimes play for the good and also are not such good examples,” said Dr. Zeppos, delivering a compelling talk to his audience in the museum’s Oprah Winfrey auditorium. 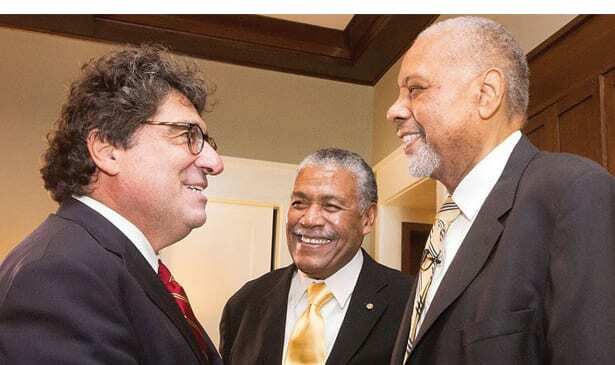 “It’s a story about reckoning, telling the truth,” Chancellor Zeppos said, setting the stage for viewing the 30-minute preview version of the 95-minute film which presents hard facts – the good and bad–of the integration effort Wallace endured. “The pain sometimes comes with comfort and peace,” he said, in describing the traumatic year of Wallace’s debut initially shared with Godfrey Dillard, who left the team and university early due to an injury, and the roller coaster ride he, his team mates and coaches endured in navigating a previously un-traveled route into the future. 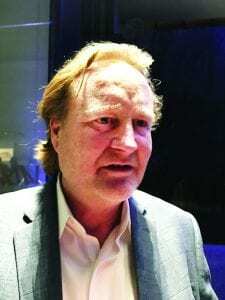 Dillard, who is interviewed in the film, attended the event here, as he did a previous one earlier this year on the Vanderbilt campus in Nashville. Like Wallace, Dillard was unhappy over how Vanderbilt handled he and Wallace’s debut on the team and the initial reaction from more than a handful of Vanderbilt peers and teachers and those at other SEC institutions. After graduation, earning a law degree and eventually settling in Washington as a law school professor, Wallace did not actively engage with Vanderbilt for more than 20 years. Chancellor Zeppos gave his talk just a few steps from where the late Rev. Dr. Martin Luther King Jr. gave his historic “I have a dream” speech on the steps of the Lincoln Memorial on The National Mall in downtown Washington, D.C.
Zeppos’s compassionate speech about Vanderbilt’s step out of embracing segregation and into its future of cultural pluralism resonated with some of the oratory of the 1950’s and 1960’s. While introducing the “TRIUMPH” film as evidence Vanderbilt and Wallace courageously broke the SEC color line in 1967, Dr. Zeppos hailed the university’s efforts since then to become a modern day first class institution, noting its entering class last fall of 1,600 students was 45 percent diverse and efforts to diversify the ranks of its staff and leadership teams continues. “Vanderbilt continues on a path Perry started,” Dr. Zeppos said. Gesturing to Dillard and posthumously to Wallace, Dr. Zeppos continued: “Thank you for all you’ve done for America,” he said, as Wallace’s widow Karen, and their daughter, Gabby, listened in the audience. Chancellor Zeppos also used the occasion this month to announce establishment of a new Center on Sports and Society, a research and development effort that explores race, sports and society. He offered no immediate details about the new venture. The Perry Wallace film, introduced earlier this year in Nashville, is a 95-minute documentary about Wallace, the 1966 Pearl High School graduate, who went to Vanderbilt to earn a degree in electrical engineering. 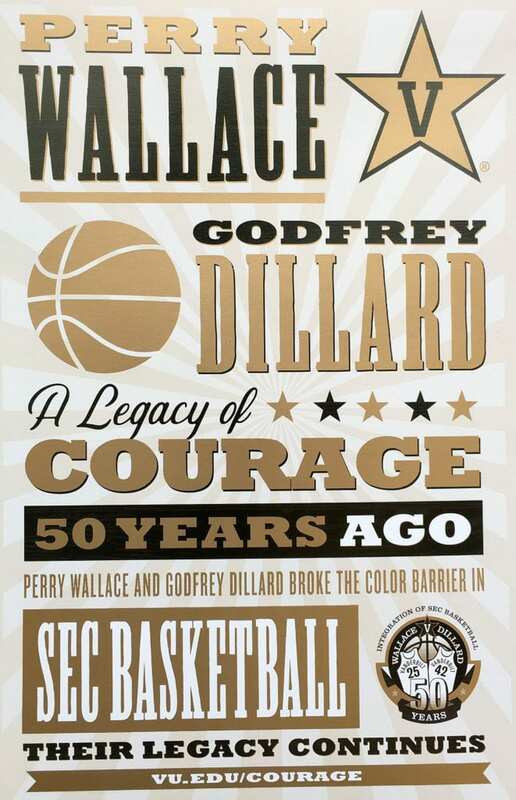 While pursuing the college degree, Wallace lead Vanderbilt into intercollegiate history as center on the university’s basketball team when it broke the racial color line in the all white Southeastern Conference of interscholastic college sports. His debut year was laced with racial insults on campus and on the road and countless jeers questioning his presence on the basketball court and in the game. The film is set for a national debut in a few weeks with showings in theaters across the nation, starting in Los Angeles and New York, according to its producer Rich Gentile. Here, in Washington, the evening event was attended by a variety of people with roots in Tennessee, including Congressmen Jim Cooper of Nashville and Steve Cohen of Memphis, respectively. Howard University Department of Afro-American Studies chair Greg E. Cooper, a Nashvillian, was among the diverse audience of guests. “It was really educational for me,” said attorney Rita Sanders Geier, a Fisk University and Vanderbilt University School of Law graduate who attended the gathering. Geier, a native of Memphis, credits the film with being a refresher of life as it was for progressives in the South in the 1960’s. For sure the documentary exposed Vanderbilt’s downsides, she said. Still, the university got the credit it deserved for stepping forward, she said.